Do you ever set ideal goals in your head then get pissed off with yourself that you’re not doing anything about them?! Or started out in a blaze of glory, then realised the regularity of executing them has evaporated amidst all the distractions of daily life?! I have done both – for YEARS! “I’m getting up super early and going to the gym before work tomorrow morning….” Then hit the snooze button repeatedly until you’re left with 10minutes to roll out of bed, get dressed and make it to work by the skin of your teeth, with no gym session? “I’m on a diet from Monday…” Then by Friday night, you’re on your way home drunk with an obligatory stop at McDonalds or the nearest kebab shop? Frequently throughout 2014, I did both of the above! Why? Because the only person holding me accountable, was me. Which clearly wasn’t enough pressure. 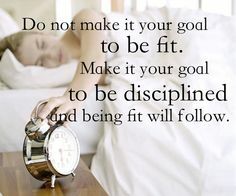 There’s no substitute for accountability and consequence when setting yourself a goal. It may sound dramatic or even over the top, but one of the resources I’ve been given by my mentors is a book that makes you write how you would spend the next day/week/month/year if you were told that’s all you had left to live. It’s full on! Unfortunately, for most people, it takes that kind of drama to kick your arse in to action. It took a bereavement to make me want to start making more of my life. Most of us are naturally programmed to drift along with ‘average’ being acceptable. To take the easy route. Not to push ourselves through any unnecessary effort or pain. Speaking from much experience, Stuart (now a multimillionaire from successfully working for himself online since 2007) explained to us that there is no point focussing all your energy on only one of these areas and not the others. You simply won’t be happy and fulfilled unless you are giving the best of yourself consistently to all three. Stuart is leading 35 or so of us in a challenge to develop said habits in the first 90 days of this year. He is also holding us fully accountable in a private group on Facebook. If we fail to provide proof, we’re out! I can tell you after 4days that it is pretty bloody effective when you see everyone else gunning for it – you don’t want to be ‘that guy/girl’ that flunks it first! If you’d like to hear more about what Stuart has in mind for us all in 2015, click HERE to check out his latest video. The New Year may have started but it’s never too late to be setting a few small but important goals with the aim of turning them in to longer term ‘happiness habits‘. If I can help you with this, just let me know! PS Below is my pledge to group involved with the above challenge – I won’t lie… it was a little terrifying… $250 is a lot of money to lose just because I “can’t be bothered”.